The addition of beautiful live greenery, flowers, and trees in your offices, lobby, and waiting room have a dramatic effect on the ambiance of your space. Having poorly maintained plants and trees, however, gives your customers and clients a negative impression on your business. That’s why we offer our Plant Maintenance with Guarantee service. One of our specialties is working to renovate your business space using recycled plants and planters mixed with new details to provide a fresh, new look. To keep your greenery looking at its best, we offer scheduled maintenance service that fits your business needs. 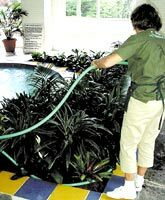 All of these services are performed as necessary and provided on a regular basis to ensure all plants remain in healthy, beautiful condition. The program is available with our complete guarantee that any plant will be replaced should deterioration occur. We can provide you with a quote for maintenance services based on your individual needs – contact us today for a no-obligation consultation!